As with my recently-posted route maps, I have made two versions. The smaller file for slow connection (215 KB PDF) and the more detailed version with hill-shading (4.5 MB PDF) that also shows the landforms. I like how the shading emphasizes the two distinct river valleys that make up the park. 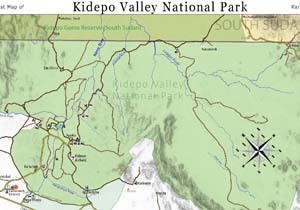 To my knowledge this is the first printable map of Kidepo with such great detail. That is unfortunate, considering that Uganda is Lonely Planet’s “country of the year” for 2012. This perspective emphasizes how much the tourism activity is all bunched in the southern Narus Valley, and how empty the Kidepo Valley is. Travelers should be aware that although UWA generally stocks diesel fuel in the Park, it is rarely available to the public and petrol (gasoline) never is. Except at Nga’Moru Wilderness Camp, food and drink supplies in the region are similarly unreliable. Apoka Lodge does not serve walk-in guests. Medical services in the indicated clinics are very limited. The only approved guest entry points are at Katurum and Nataba. 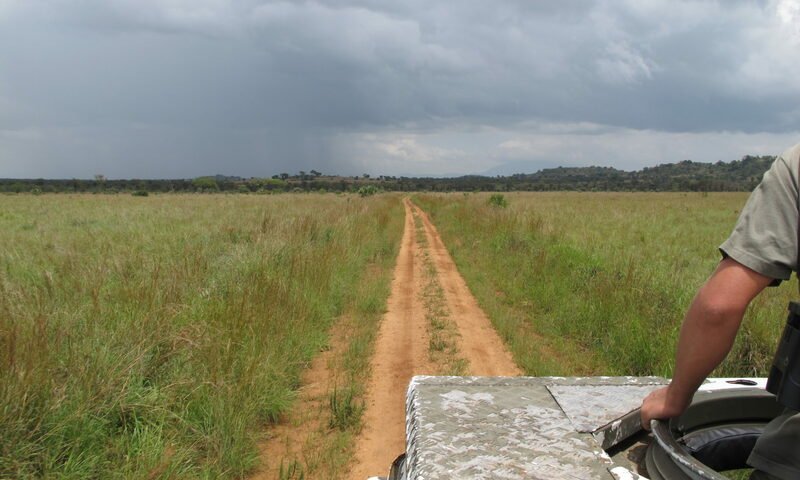 All roads in the park require a sturdy four-wheel-drive vehicle and are especially treacherous during the rainy season. The Uganda Wildlife Authority (UWA) requires guests traveling beyond the boma northwest of Apoka to be accompanied by a ranger. This includes the popular hot springs destination at Kanatarok (or Kanangarok). Driving off-track is hazardous and prohibited. All of the rivers and streams are seasonally intermittent, and some are prone to flash flooding. Water holes and swamps indicated on the map are mostly perennial. Many thanks to everyone who helped me map these roads, especially Pat at Nga’Moru, Nigel at Karamoja Safaris and Tyson at EverySafari. As always, I welcome questions and comments at my contact page. This looks great, Lukas. Hard work = Good results. these are very nice. How did you make them? cheers. Thanks for asking. I exported GPS tracks of the roads from My Tracks on an Android phone and traced these into Openstreetmaps using JOSM. I traced rivers and additional trails from satellite imagery by Microsoft and boundaries from UN and UG govt documents. I used Maperitive to re-export the OpenStreetMaps data together with the hill shading bitmap from NASA elevation data into Adobe Illustrator. I cleaned up the presentation and added the legends, icons (from nps.gov), titles and compass rose in Illustrator and then exported to PDF.